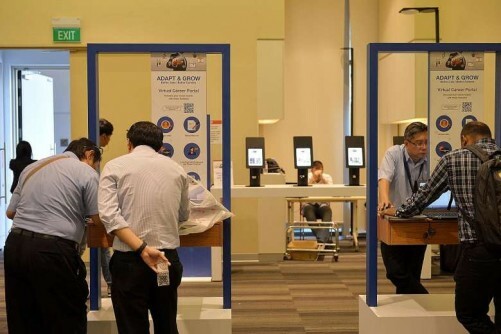 The turbulence in the job market of the past year and a half is an inevitable effect of Singapore's shift towards quality growth, said Manpower Minister Lim Swee Say yesterday. "I hope what we are going through in the last 18 months is just a transition from manpower-driven growth into a future of growth driven by productivity and innovation," he said. He was speaking to reporters yesterday at a career fair, where he launched two new programmes to help workers join the hotel sector and carve out better careers in it. Labour market figures released a week ago show rising unemployment, layoffs at a seven-year high, and job seekers outnumbering job vacancies for the first time in four years. Mr Lim said that although the economic situation may look dismal as a result of companies restructuring amid global headwinds, Singapore must push on with efforts to boost productivity and innovation in order to drive growth. "There will be disruptions, there will be retrenchments, there will be downsizing in some sectors," he said. "But on the whole, it is not our objective to make low growth a new normal in the Singapore economy. Rather, this is hopefully just a transition period as we pursue quality-driven growth of 2 to 3 per cent in the medium term." He acknowledged that a growing number of Singaporeans are concerned unemployment will rise further, but said the solution to this was not simply to create more jobs. "If we are not careful, unemployment might go up not because we don't have enough jobs but because there is a mismatch between jobs and skills," he said. "We want to minimise this mismatch. "This means making every job a better job and every career a better career and, hopefully, every worker will enjoy better pay."